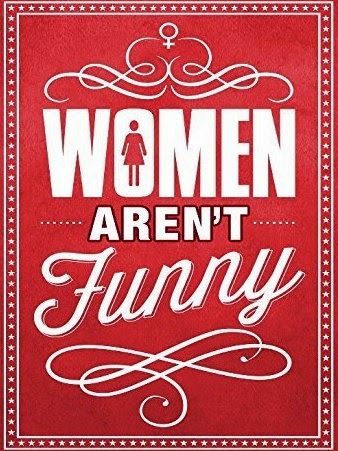 Caught an interesting documentary last night on Netflix called, Women Aren't Funny. The doc is directed by and stars comedian Bonnie McFarlane; and in it, Bonnie tries to answer the question (that I don't know who is asking), "Are women funny?" To me, the answer is obvious. Yes. Of course, women are funny. Who keeps asking? Well, I guess people do keep asking because McFarlane found plenty of people (mostly male comics) who were less than certain about their answer. This documentary is very much a comedy insiders film. One needs to be pretty well versed in the history of stand-up comedy and in the lifestyle of comedians to fully appreciate it. McFarlane splices together interviews with numerous comedians, both male and female, and all are asked if they find women funny. Obviously, all of the female comics answered yes. As far as the male comics go, the results were mixed. Overall, I enjoyed the film, but I do question some of the editing decisions with regards to the male comedians. Many said they didn't find women to be funny. However, most all of them later qualified their comments by talking specifically about female comedians they have seen or worked with. In one example, the late comedian Patrice O'Neal said bluntly that he didn't feel women are funny. But toward the end of the movie, he rattles off a list of females he finds funny. So, his answer is less than definitive. This was the same with some others, as well. Many of the comedians and club bookers were quick to point out that there are so many fewer female comedians than males that it is hard to accurately gauge general appeal of female comics. Former Howard Stern Show sidekick, Artie Lange, argued that most male comedians aren't funny and the same applies to women. The bookers spoke in raw numbers: fewer people come out to see female comics, therefore they get booked less. It's hard to argue with that logic, but it still shows a serious amount of sexism. If you internalize the idea that women are less funny, it is easier to come to the conclusion that it's bad business to book female comics in their club. In between the interviews with comics, McFarlane splices in some footage of her life off the stage. Her husband is a comedian with a higher profile, and the two often tour together. This is great from a family perspective, as it allows the couple to travel with their young daughter. However, it causes McFarlane to question whether or not she would be successful if she didn't have a headlining husband's coattails to ride. The question is not really answered. By the end of the film, McFarlane seems exhausted by the whole process and disappointed in the results of her numerous interviews. Feeling frustrated by her lack of notoriety as a comic, McFarlane dresses up as a man (complete with a fake beard), calls herself "Barney Mac", and attempts to perform her normal stand-up routine. Would audiences like her material more if it came from a male comic? Well, this one was not really answered. Her set as "Barney" was not a success. The crowd was largely indifferent. A visibly distraught McFarlane can be seen crying after the disappointing set and seeking consolation from her husband. I don't think this experiment was all that illuminating because McFarlane looked like a woman in drag and didn't have a very masculine voice. No idea if people suspected she was a woman dressed as a man, but she certainly did not seem like a "normal" man. However, because good a comedian's material is so tied into a person's true self, could this experiment ever work? By definition, while dressed as "Bernie," McFarlane was not being her true self, and the material suffered from that. Sidenote: I have seen Bonnie McFarlane do stand-up on Comedy Central and she is very funny. At this point in time, it is sad that questions like, "Are women funny" even need to be asked. I mean, have you not heard of Joan Rivers, Roseanne, Sarah Silverman, Amy Schumer, Laura Kightlinger, or Chelsea Peretti? That's only the first six I could think of off the top of my head. The list is much longer. If you still, in 2015, question whether or not women are funny, you may not be persuaded by watching this film. But I think that shows more of a subconscious resistance to female comics than any demonstrable fact about women's ability to be funny. Unfortunately, the whole world of live improv was ignored. Many of the most famous funny females (i.e. Tina Fey, Amy Poehler) were very successful in that world. It's not traditional stand-up comedy, but it is comedic live performance, and many of the top women in TV comedy come from that world. Overall, Women Aren't Funny is a decent film and definitely worth watching. And, if Bonnie McFarlane makes her way to Omaha, I would definitely go out and see her perform.